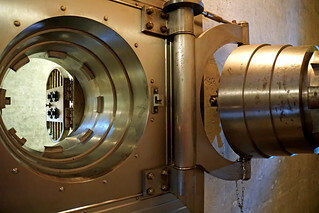 The Bank of Canada vault in the Diefenbunker, where the 800-tonne federal gold reserve could be stored if a nuclear attack was imminent. It is a separate underground building that is connected to the main bunker by a tunnel. The door weights 10-30 tonnes and four people (each with a different combination to one of the four locks) are required to open the door. It could have held 800 tonnes of gold bars, but no gold has ever been stored here. This was back when countries were on the gold standard, guess it would not be needed to day. It is funny to note that if under attack the government had 30 minutes to get to the bunker. A dry run was done to move the gold to here - it took 4 hours....... they would be dead.